The invention of LED lighting on one level has been brilliant. The rock and roll business has completely transformed that industry. But rock and roll and theatre are completely different to the environment that we work in. We work in a colour critical environment and our whole raison dtre is to reproduce life faithfully. If you havent got a continuous spectrum you cant do that. Were used to tungsten light and daylight. Technically tungsten filament is the closest thing we have to a black body radiation source which means that you get a continuous rainbow out of it. If you dont and there are frequency dips (which there are in LED and fluorescent sources) when unmanaged or not handled correctly, you cant reproduce life as we see it. There will be deficiencies, there will be colour casts. There are an awful lot of cheap and nasty LED sources out there. You just have to look around the internet to find some technicians who have done some comparisons. Youll find that there is some really, really awful stuff out there. People say that you can white balance to them but the whole idea is that we dont just use one light. We mix lights, so if you pick up a tungsten light and an LED light that says its tungsten you want to be able to use them. But if you put one on one side of the face, and another on the other they should match. More often than not, they dont. And Kino Flo and Dedolight (and one or two other manufacturers) have been working hard to try and get this right. It is not easy. You get what you pay for with LED sources. If you want some bedtime reading, search for stokes gap which is about how LED light is produced. All LED lights start off as a blue light and use phosphors. That blue light stimulates the phosphors, similar to what is in a fluorescent tube. Effectively an LED is a fluorescent source as the phosphors fluoresce but then there is a dip (youll see a spike of blue and then a dip and then a rise of colour) and its that dip that causes you deficiencies. More often than not, you will find they are probably magenta. If the lights are overrun, they will get hot and turn green. You cant have these colour casts. Its got to be continuous and its got to match. If it says daylight, its got to match daylight. If it says tungsten, its got to match tungsten. You find that people who just want to make money simply stick LEDs on a circuit board and say look! Its a light! Yes, sure it is fine for lighting your garage but when it comes to the most important thing which is skin it wont do. When you cant reproduce skin faithfully youre in trouble. The Kino Flo Celeb is the LED step up from the well-known Diva-Lite. Ive had my Diva-Lite for goodness knows ever since theyve been out. Its the first lamp out of the truck, but the thing I have always wanted with the Diva is battery power. Its only 220 watts and its been kind of frustrating on a level, because for years we use to run around with sun guns which were 400-650 watts. You used to have this huge battery which was a pain in the neck. But Kino Flo has finally come out with the Celeb which is 100 watts and runs off mains or two v-lock batteries for about 2.5 or 3 hours. 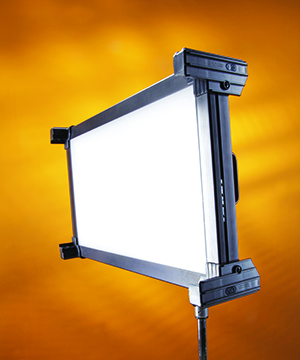 The quality is fantastic, and you can switch between tungsten and daylight. It has five pre-sets and is extremely well built, well thought out and DMX controllable. This is a great tool that is very lightweight and youve got to have stuff that bounces because we bounce around the planet in aircraft, so you need something thats rugged. I find the Kino stuff just does well. Its not very comfortable sat under lights with hard point sources but when you have a nice soft panel of light, it is much easier on the presenter and actually in the world of HD gives you much better image. Badly, hard lit sets show every blemish in the skin. But Kino Flo stuff gives a great light and is completely controllable.